The wreckage of the Manx2 plane in February, 2011. THE FINAL REPORT into the plane crash at Cork Airport which killed six people nearly a year ago is expected to be released in the coming months. Investigators from the Air Accident Investigation Unit (AAIU) issued a preliminary report into the crash in March of last year and have been carrying out further inquiries since. Next Friday will mark the first anniversary of the crash in which a Manx2 flight from Belfast to Cork went down during heavy fog at Cork Airport. Six people – two pilots and four passengers – were killed in the crash while six other passengers survived. The AAIU – which is part of the Department of Transport – published an initial report in March of last year which found that there were no mechanical faults with the plane. It is due to publish its final findings within the next few months, TheJournal.ie has learned. Investigator Leo Murray reported last March that there had been no failures in the airframe or the facilities at Cork Airport during the flight or at the airfield. The aircraft – which Manx2 had leased the operation of to Spanish aviation company Flightline - made three attempts to land during heavy fog at Cork Airport before crashing just before 10am on Thursday, 10 February 2011. The preliminary report said that several factors into the crash were still being investigated, including the experience and training of the pilot and the co-pilot. A spokesperson for the AIUU told TheJournal.ie this week that it has been a “complex investigation” but that it is “well advanced” at this stage. It is understood that Murray is leading the investigation along with four other investigators who work in the unit and are examining various aspects of the events surrounding the crash. Email “Final report into Cork air crash expected within months”. 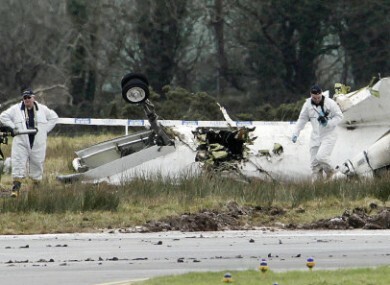 Feedback on “Final report into Cork air crash expected within months”.